The "risk-on" stock market is getting a wedgie, and so is its "risk-off" counterpart, the U.S. dollar. The U.S. stock market is getting a wedgie, and so is the U.S. dollar. That matters, as wedges tend to break up or down in a big way. Stocks are a "risk-on" trade, the dollar is a "risk-off" trade, so they are riding a see-saw with wedgies. 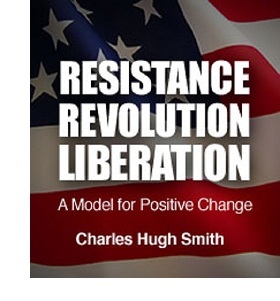 Yes, I realize this is an unpleasant image, so let's turn to the charts. A wedge is characterized by a compression of price into a narrowing triangle as Bulls and Bears battle over who will lead the next trend. The wedge is clearly visible on a daily chart of the S&P 500 (SPX). Note the loss of momentum in the recent uptrend as RSI, the Bollinger bands and the 20-day moving average (MA) are all trending down. 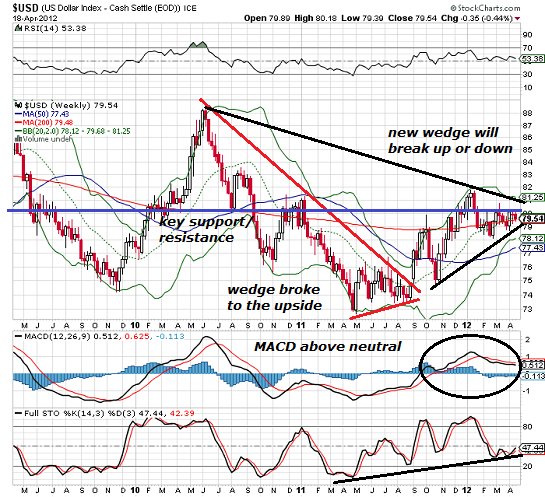 We see two wedges on this weekly chart of the U.S. dollar index (DXY, or on stockcharts.com, USD). The first wedge was traced out between May and August 2011, and it broke to the upside in early September 2011, resulting in a 10% gain in the next few months. Now another wedge has been traced out around the key long-term line of support and resistance around 80. The direction of the break may be telegraphed by MACD, which is solidly above the neutral line and the stochastic, which is also trending higher. 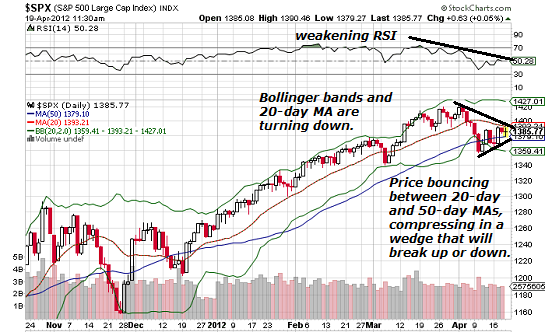 Here is a daily chart look at the same wedge. 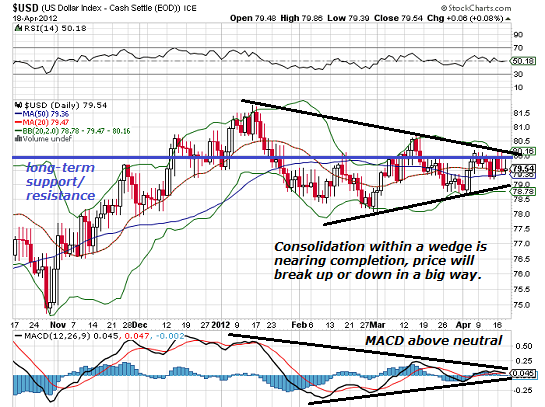 Even the MACD has formed a wedge of consolidation-indecision. Since the SPX is risk-on and the dollar is risk-off, then any move in one will likely be reflected in the other. These wedges are nearing the point of decision, so next week might be slightly more interesting than the previous three weeks. Thank you, Alan D. ($61), for your superlativelyly generous contribution to this site--I am greatly honored by your support and readership. Thank you, John H. ($25), for your most excellently generous contribution to this site--I am greatly honored by your support and readership.